Back in 1983, we hit the golden age in arcade games. Leading the “Pack” was Pac-Man, followed by several other arcade characters like Frogger, Dig Dug, Donkey Kong, and several others. CBS turned their entire Saturday morning lineup into Saturday Supercade, which was a 4 hour block of cartoons based on arcade game characters. You could go to the grocery store to see several cereals, spaghettios, & snacks all with arcade characters as the mascot. It wouldn’t be long that they turned the digital market into the board game market. 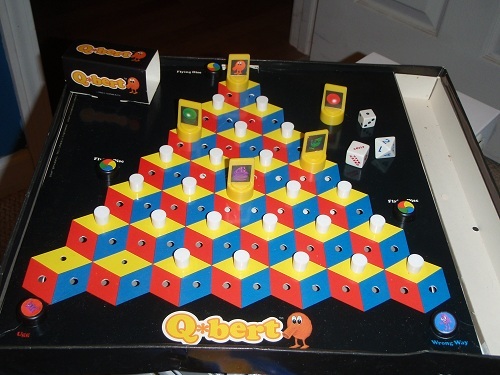 Today, we’re looking back at the Parker Brothers Q*Bert board game. According to the box, it’s “a board game based on the exciting arcade game”. In the arcade game, when Q*Bert gets stomped he says a bad word. Well, actually he has a bubble over his head that says something like “!@#?!”. They removed any faux curse words from this game. The arcade game is simple enough, you have to light up all the squares and avoid the obstacles / bad guys climbing all over the board. The board game is super complicated. There’s about 4000 pieces in the box, some of which seem to be missing in my old box. 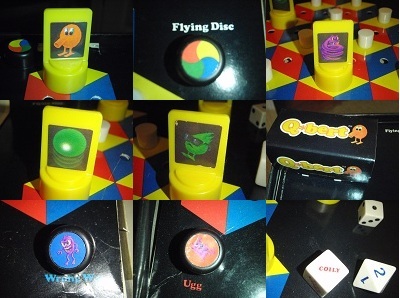 One kid rolls the dice & moves Q*Bert to collect the pegs on the board. The other kid rolls 2 dice and moves whichever “Nasty” pops up and however many spaces on the other die. When the “bad guy” kid captures Q*Bert, they swap places. Whoever gets the most pegs, wins. 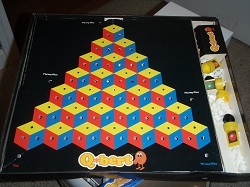 When I got this game when I was a kid, I was so excited because I loved Q*Bert. Unfortunately, besides putting all the decal stickers on on the game pieces, I don’t remember ever playing this game. I just don’t see how a kid would ever play this game over the arcade game. 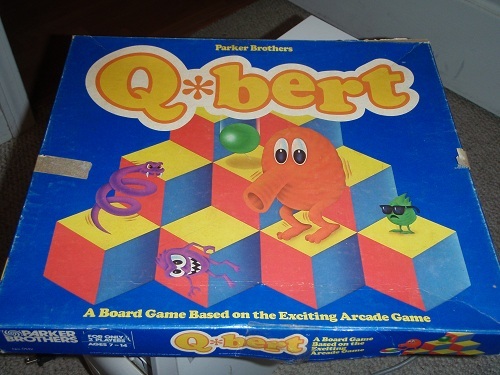 Anyway, as with everything, I found the commercial for the Q*Bert Board game on youtube, here it is… enjoy!